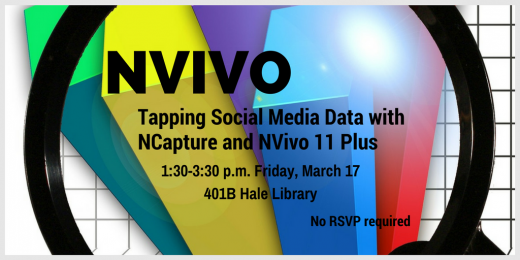 “Exploring Social Media with NodeXL Basic” is a two-hour session that introduces some of the social media data extraction and network graphing functionalities of an open-source and freeware tool NodeXL Basic. This event will be 1:30-3:30 p.m. Friday, April 15, in 401B Hale Library. This image shows an example of a network graph with small clusters of individuals in relationships and even smaller motifs. Ever wonder what sorts of #hashtagged conversations may be occurring on Twitter and who the discussants are? Curious about the social networks of particular @accounts on Twitter? Wonder what a public-facing social network looks like on Facebook? A private one? 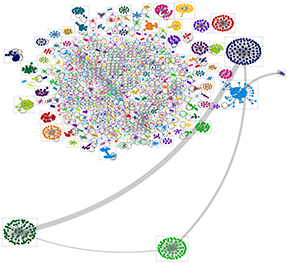 Intrigued by a related tags network from Flickr? An article network on Wikipedia? A video network on YouTube? A user network on YouTube? 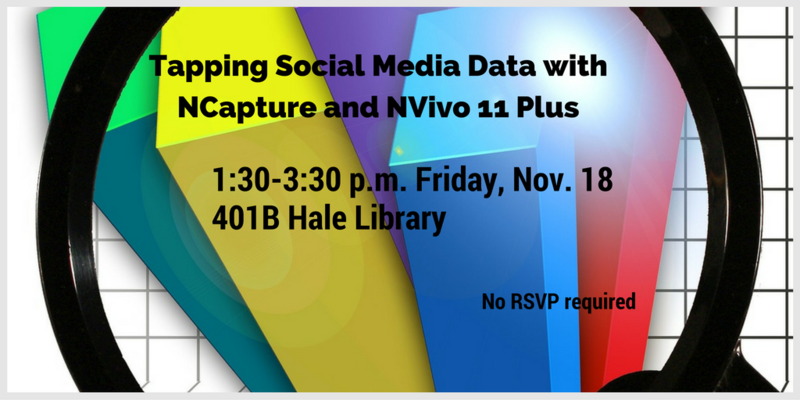 “Exploring Social Media with NodeXL” is a two-hour session that introduces some of the social media data extraction and network graphing functionalities of NodeXL. This event will be 1:30-3:30 p.m. Friday, April 10, at 301 Hale Library. Facebook is currently the foremost social networking site in the Western world. Many individuals and entities create fan pages on this social network to be their public-facing side. The ability to extract information from Facebook requires an authorized account. To practice this data extraction, this will describe the extraction of the social network around the Hershey’s site on Facebook (https://www.facebook.com/HERSHEYS). With 5.9 million likes, any crawl will have to be a limited one in order not to overwhelm NodeXL. Faculty and students are invited to attend this week’s IDT Roundtable on effective and innovative use of technology in K-State courses, 11 a.m.-12:30 p.m. Thursday, April 14, at the K-State Student Union, Room 212. More than 200 faculty/staff have registered to attend the Teaching, Learning, and Technology Showcase 10 a.m.-1 p.m. today (Tuesday, March 1) in the K-State Student Union Ballroom. Refreshments and a light lunch will be provided. Walk-ins are allowed, so faculty who only have an hour can still drop by to learn about IT tools and resources their colleagues are using. The first 200 faculty/staff to enter the ballroom will win a Varney’s gift card. Alex Sune will present “Facebook at K-State” at 1:30 p.m. Thursday, Oct. 22, in 301A Hale Library. Facebook is an integral part of posting information and events to K-State students. Attend this session to see several of these examples and learn how to get the most out of Facebook.